Sold by drivers on board the buses. This type of ticket is valid only for the journey for which it is bought. Its price varies depending on the distance travelled. Tickets are sold only in certain careers company. The price varies according to the points of origin and destination. 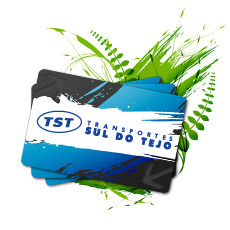 The TST pre-paid tickets are, since January 1, 2013, charged in Lisboa Viva or Viva Viagem cards. This charge will be made in Transport Units with values of  5,  10,  15 or  20 per card at TST points of sale and agents. Each Viva Viagem card costs 0,50. The Pre-paid tickets must necessarily be validated at the bus entrance at the beginning of the trip. For questions clarifications on points of sale or our drivers on the buses should be requested. The Pre-paid tickets M-Sul allows you to travel in the municipalities of Almada and Seixal, including links to Lisbon. The TST Network Pass is a monthly bus pass and allows the holder to travel an unlimited number of times on routes within the chosen area. This area has a specific code. The Route Pass is a monthly bus pass valid for an unlimited number of journeys on TST buses on a specific route. The Combined Pass allows TST services to be combined with other transport operators and allows customers to travel on a vast range of networks. The Urban Pass is a monthly pass and can be used for an unlimited number of journeys on the urban network it is bought for.